I left Spit Junction, and about 10 minutes later into south-west Mosman I came upon two wonderful sights. The first sight, off in the distance, was the Sydney Harbour Bridge. The second sight, only a few more minutes ahead, was a service station. A few minutes later I walked out of the service station with two 1.5-litre bottles of water in my backpack, and continued downhill to the south-west. Shortly after, I made one of my favourite discoveries during my walk – the spectacular suspension foot-bridge over Reid Park. I crossed over the bridge, went down into Reid Park and headed south to the Cremorne Point peninsula. The peninsula would also become one of the favourite parts of my walk. Not only was it very picturesque with its blend of waterfront bushland and impressive homes, but there’s also a great walking path around the entire length of the peninsula. About halfway down the eastern side of the peninsula, I took another break and indulged in more water and muesli bars. Soon after that, I found myself at the lookout at the end of the peninsula and a truly staggering panorama of Sydney Harbour. Shortly after that, I sat at a picnic table near the lookout and wrote to a friend I hadn’t seen for some weeks who’d emailed me not long after I’d left Spit Junction. As I resumed my walk along the western side of the Cremorne Point peninsula, my friend and I exchanged messages via smartphone and eventually we agreed to meet for dinner at Darling Harbour, about half an hour’s walk beyond the Sydney Harbour Bridge, at 5pm. It was now almost 2:30pm. Could I make it all the way there in time on foot? In the end, to make sure that I would make it to dinner on time, I decided to cancel a couple more scenic walks around a couple more peninsulas. Instead, I focused on heading as directly as I could towards the Harbour Bridge. 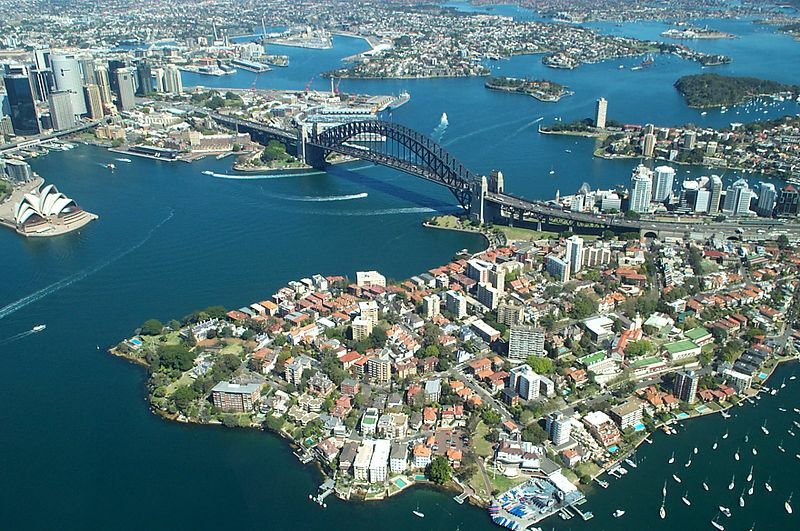 I came north around Neutral Bay and bore south-west through Kirribilli to the north end of the Harbour Bridge in Milsons Point, which also became a trip down memory lane. As I’ve mentioned in previous posts, for most of the 2000s I worked in North Sydney and I often walked home from there across the Bridge. I couldn’t remember the last time I’d walked across the Bridge – 2009? – so when I arrived at the steps leading up to the pedestrian walkway, a lot of pleasant memories returned. It was also an ideal place to take my last break before the final stretch into the CBD. The steps up to the Bridge were the last uphill steps I would have to face on this walk. Fortunately, they were familiar steps and nowhere near as narrow and intimidating like the previous steps I’d encountered, so up I bounded. The walk across the Bridge, and especially on such a great day as this, was just as enjoyable as I remembered. Soon I was at the south end of the Bridge and bounding down the steps there into The Rocks, one of my favourite parts of Sydney. Soon after that, I entered the northern edge of the CBD. Just before 3:30pm I crossed to the corner of York and Margaret Streets near Wynyard station, where I officially declared my walk to be over. I had made it all the way from Manly on foot. It was a very satisfying feeling, indeed. There was still an hour and a half until dinner time. A few minutes later I took a seat in a pleasant cool pub and had the first of two leisurely pints of ice-cold diet cola. Each of them would taste wonderful. Another of my 2014 resolutions had gotten off to a good start. The next day I felt a little sore all over, but I declared that day to be that week’s Sabbath and I did very little except rest and enjoy it. And in the days that followed, I found myself more and more looking forward to the next weekend and the chance of another walk. I consulted Walking Coastal Sydney again and did some thinking. What walk would come next? But that’s a story for another series. This entry was posted in Action, Happiness, Hope, Inspiration, Life Challenges, Life is Good, Life Strategies, Travel. Bookmark the permalink.